3M™ Scotch-Weld™ Threadlocker TL42 provides vibration, corrosion, and shock resistance for fasteners in assembled form. This medium-strength anaerobic adhesive is dispensed as a one-component product. 3M™ Scotch-Weld™ Threadlocker hardens and seals threaded assemblies to dampen vibration and prevent loosening or leakage of secured fasteners. Applying this adhesive to fasteners before tightening seals out moisture and prevents corrosion. Application is fast and easy with just a targeted squeeze of the bottle. The anaerobic formulation begins to cure quickly into a polymer that seals, secures, and retains. The medium strength adhesive loosens when needed with regular hand tools. 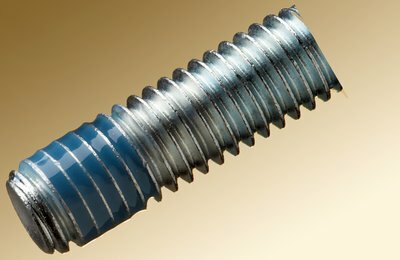 Scotch-Weld Threadlocker TL42 is effective for locking, vibration dampening, threadlocking, sealing, adhering, gluing, and bonding threaded assemblies. Places where it is useful include machine tool access bolts, and hydraulic system bolts, gear box/driveshaft bolts, bearing cover cap screws, countersunk screws and conveyor roller bolts. Tested to Military Specification, MIL-S-46163A. Anaerobic adhesives are uniquely formulated to cure in the absence of oxygen. The term "anaerobic" means "living without air" and when the oxygen is excluded, a chemical chain reaction begins that causes the adhesive to polymerize. Contact with metal speeds the polymerization process and rapidly accelerates the curing process, forming tough cross-linked plastic that provides aggressive adhesion with effective shear strength. More commonly referred to as threadlockers, thread sealants, retaining materials and flange sealants, these adhesives are often used to enhance the seal, or holding force, in the threads of joined fastener systems such as nut-and-bolt assemblies. A nut-and-bolt assembly may have as little as 15% metal-to-metal contact and even a small amount of anaerobic adhesive readily fills any air voids between the threads and then hardens to a thermoset plastic. These unique, high-viscosity adhesives are easy-to-dispense, cure rapidly, and provide effective torque strength while resisting temperature and vibration and sealing out moisture and gasses to protect against corrosion. 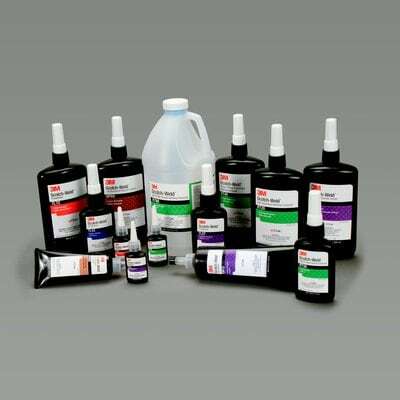 Anaerobic adhesives can decrease manufacturing costs, enhance equipment reliability, minimize aftermarket breakdown, and reduce warranty claims.